Quick? Yup. Easy? Most certainly. Indian? Well, yes – but also much more besides. Anjum’s multicultural upbringing is reflected in her innovative Indian food, which explores lesser-seen regional Indian specialities whilst introducing techniques, ingredients and influences from across the globe. Anjum makes no secret of the fact she’s an all-round foodie. Although it was undoubtedly Indian food with which she found fame, this woman is endlessly fascinated by all matters culinary. Many a lazy comparison refers to Anand as ‘The Indian Nigella’ – but I’d be willing to wager that her pantry is even more exotic than The Domestic Goddess’s. In London at least, it’s currently more common to come across a newly-conceived ‘hybrid dish’ than a simple, straightforward staple. But in the main, these ‘culinary mashups’ usually display about as much regard for one’s dietary health as they do for good taste. Anjum’s recipes, on the other hand, both fuse flavours and show a healthy concern for nutritional issues. In fact, ‘Anjum’s Quick & Easy Indian‘ flauts quite a few accepted norms. Indian food is infrequently regarded as either speedy or simple; whilst ‘fast food’ is endlessly synonymous with ‘junk food’. But a quick flick through the book’s pages reveals nothing but vibrant, wholesome-looking dishes that look like they’d leave you feeling as clean as the imagery. The recipes are about as far removed from dirty food as can be, and the book is a breath of fresh air in a culinary climate where ‘dude food’ just won’t die. I don’t know about you, but I for one would far rather have a dinner to die for than die FROM it. There’s no risk of that here; but don’t fret – Anjum’s not all about lean cuisine. What she is driven by is top taste, and, like many sage gourmets, has simply learnt that sharp, clean flavours both please the palate and benefit the body. Refreshingly, she’s no self-styled saint, the first to admit she’s not adverse to a shortcut or three. The ‘Take One’ feature is a clever little concept; sections scattered throughout the book, each recipe trio based around an easily-available ‘bedrock’ ingredient like a tub of ricotta or a jar of chutney. In keeping with the ‘international Indian’ ethos, not all are subcontinental specialities – a pot of yogurt gives you tandoori salmon tacos, spiced cornbread, and ‘flying chicken wings’. Anjum unfailingly works in a little India into even the least-likely candidates; her tiramisu is a ginger chai version, bruschetta is flavoured with Bengali panch phoran, a baked ricotta cake gets garam masala-d. It cuts both ways, too, with authentic Indian dishes going international; superfood-stuffed Peshwari naan, pani puri with avocado or caviar, masala potatoes in a rice paper wrapper, not dosa batter. But look past all the invention, and you’ll see that Anjum’s dishes are deeply and clearly rooted in authentic, traditional regional Indian specialities. She’s done clever things with them, sure, but they’re not simply plucked them from thin air – this woman knows her stuff and has evidently extensively explored the kitchens of India. You’ll find a reworked Calcutta classic in Anjum’s kathi rolls, a take on Nepal’s insanely popular momos using ready-made wonton skins, and a cracking Konkani squid dish that’s ready almost as soon as it hits the hot pan. A potato-and-egg preparation might speak to British sensibilities, but it’s a classic dish that’s purely Parsi in origin. There’s a korma, too, but not the Brindian curryhouse contrivance; Anjum’s is a light, fragrant Hyderabadi concoction. The food in ‘Anjum’s Quick & Easy Indian’ is consistently diverse and surprising; but it’s no surprise that the instructions never divert from being consistent, clear and concise. With five books already under her apron, Anjum is a woman who understands the value of a rock-solid recipe. As any cookbook-loving home cook appreciates, prime bookshelf real estate is reserved for those tomes that stand the test of time, not the ones that mess up your meals with ambiguous instructions and inaccurate measurements. Like Ronseal, ‘Anjum’s Quick & Easy Indian’ does as it says – but it’s also a rare example of a dependable volume you can also depend on to inspire and excite. Were my head any more egg-shaped, I’d be tempted to go and boil it. But I’m aware that not many people are quite so nerdy when it comes to cookbooks; and, indeed, many people can’t complete culinary tasks as basic as boiling an egg, let alone mixing a masala. As a seasoned cookery tutor, Prett Tejura understands the limitations and fears of the home cook only too well. This lady has spent years teaching the language of spice to would-be Indian food aficionados, creating quite a few along the way… Not least her own kids. Until now, she’s only shared her skills in the flesh; but now you can keep a bit of Prett’s practicality in your own kitchen. Prett’s the best-known face of cookery school and condiment company Curry Cuisine, but the whole thing is very much a family affair. Her husband Paresh is just as up to his elbows in marinade as she is; and the recipes in Prett’s first book are all dishes the pair share with their children, friends and extended family. Hence, ‘Family Secrets’. The book has a beautifully subtle, slightly-embossed matt cream cover, and feels almost like the sort of notebook you’d have been handed were you lucky enough to be part of a similar delicious dynasty to the Tejuras. It’s not splashy or high-falutin’. Like the best mums, it just quietly gets on with doing what it does. 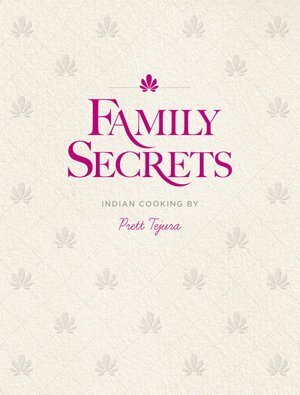 And what ‘Family Secrets’ does is simply renders Indian cuisine most accessible to even the most novice of spice cooks. Although some of the dishes are relatively esoteric, Prett doesn’t make a song and dance over including them – omitting the sort of hyperbole that’s guaranteed to put The Fear into a cook faster than you can say ‘unusual festive speciality’. Although it’s perhaps a shame cooks might not realise quite how magical what they’re making is, the low-key approach does mean they’re all the more likely to just give it a go. If this results in more folk frying up their own jalebi, fantastic. And if they ditch the dusty pre-blended powders and get grinding their own garam masala too, even better. It’s a comprehensive little cracker. Chapters cover ‘traditional Indian food’ like keema and kadi; regional specialities such as Chettinad curry; snacky street food including pau bhaji, chilli paneer and home-made chevdo; and celebration dishes like the divine Diwali dry fish. Sections on bread and rice; condiments; and some lovely desserts round out the book like a particularly well-fed Nawab. There’s also a handy little spice glossary. Although I’d have liked Hindi names alongside English counterparts, that lack of vocabulary won’t preclude you putting spices to proper use – Prett’s recipes rove the remit pretty widely, meaning you’ll soon be au fait with each aromatic’s distinct character and how it likes to be treated. For the most part, Prett sensibly sticks to commonly-available ingredients; you’ll even find the odd squeeze of tomato sauce. After all, this is home cooking from a British Indian household, not haute cuisine from a Hyderabad hotel. What’s wonderful is when she slips in lovely Indian veggies alongside the cabbage and potatoes – lilva and tindola turn up all-too-rarely in recipe books. Despite the easy, breezy methodology, ‘Family Secrets’ is not dumbed-down. In fact, the biryani even uses the traditional dum cooking technique, simply replacing the dough with foil. The authentic results yielded by the straight-forward recipes are testament to Prett’s understanding of how to communicate complex khana in a compelling manner. This book is penned by a woman who knows how people actually work in the kitchen, and how best to instil confidence in cooks when they’re embarking on a journey into unexplored culinary terrain. The anecdotes that smatter the pages like splashes of sauce soon will give the whole thing a warm, familial tone, giving the recipes both context and character. ‘Family Secrets’ does what it says on that welcoming front cover – it’s a compendium of the clan’s best-loved dishes, cooked just as they would be in the home, presented practically and with perceptible relish. The Tejura tribe is nice, and so the spice. So if you need more in your own life, order ‘Family Secrets’ and get Prett in your kitchen, pronto. Does the fact that I copyedited Devnaa’s latest cookbook make me biased in its favour? Not a bit of it – working on the raw manuscript just made me all the more antsy to get my hands on the final copy. I’ll admit I felt a little trepidation when the postman popped it through the door – but this royal purple tome, bearing bright, rangoli-like patterns, did not disappoint. Because, for one, it both celebrates and demystifies a cuisine that’s disappointingly under-represented on bookshop shelves and in restaurants – home-style Gujarati fare. Hearty, humble and pretty darn healthy, Guji food is the just the sort you could gorge on and still feel just gorgeous. And Roopa’s recipes are for pretty gorgeous Gujarati food indeed. Omitting animals from the menu merely creates more space for creative innovation with roots, shoots, greens, beans and lentils. There may be no meat or fish, but there’s plenty of protein; lots and lots of legumes in myriad forms. You might say Gujaratis have their finger on the pulses, so to speak, and can happily base an entire banquet on little more. Furnish your table with snacks like the pea-filled kachoris and steamed lentil dhokra – a dead ringer for American cornbread-, vats of the festive undhiyu, and comfort classics dal makhani and cholle, and you’ll find there’s absolutely nothing meagre about this meal. Mealtime tales from Jay and Roopa’s family pervade each recipe in ‘Devnaa’s India’ like the awesome aroma of a newly-cracked open pot of their signature spinach and corn kofte biryani. Recipes are for the food the pair grew up with – the food they love; I love; and you, too, will love. Can you feel the love? If not, get cooking, and you soon will. It’s hard not to fall seriously hard for a book which contains within its pages the answer to a mystery more confounding than the Bermuda triangle, and similarly shaped: how to turn out super samosas with that perfect pastry. I can wager you’d never have cracked it alone – the knack lies in toasting the dough on both sides prior to use – but by jingo, it works. As does pushing a single pea into one corner to ensure the flavoursome filling stays secure – the sort of nifty trick which becomes instinctive with a lifelong knowledge of a certain cuisine, but totally eludes the keenest amateur enthusiast. But Jay and Roopa are sharing, caring folks, and want you to create great food. There’s absolutely no stingy stashing of family secrets here. But no matter how generous you are, it’s impossible to share the secrets of ‘andaaz’; that Indian intuition that allows you to judge precisely how many mustard seeds will make your salad-like sambharo pop, or accurately guesstimate the correct cooking time for a bhindi masala to make it more ‘sublime’, less ‘slime’. 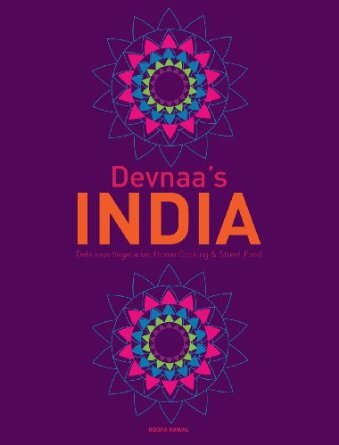 So ‘Devnaa’s India’ handily helps the hapless overcome the handicap, with a little hand-holding and a lot of in-depth info. The book opens with a concise guide to essential ingredients and equipment, all refreshingly easily obtainable, despite the unusual nature of the preparations of which they’re then put to use. Much of the food in ‘Devnaa’s India’ is esoteric. Even items like tadka dal, samosas, pakoras, and lassi, all of which arguably have become as much a part of the British menu as pie and mash and beans on toast, come with a delicious dusting of that magic seasoning: the home-style touch. That alchemy is an intangible, indefinable quality in food – one that restaurants really can’t replicate. You’ll sense it if you eat at an Indian home, explore the menus of streetfood upstarts, or patronise cafeterias and snack shops in Indian areas – and once you develop a taste for it, you’ll miss it when it’s absent. Buy hey, it’s okay – start cooking from this book and you need never be bereft. Any book that can teach you how to prepare patra like a Gujarati grandma is worthy of great accolade. But most recipes are found only in those tempting little tomes at the checkout of the Indian supermarket, rich in idiosyncratic instructions like ‘heat a vessel over a low flame for some time’ and ‘cook until pinkish and no raw smell remains’ – guidelines guaranteed to befuddle a British cook. Until now – because these benevolent siblings have ripped up the rule book, presenting all those rare recipes for the common man. If this gets Dave in Dalston rustling up ragra pettis and knocking up khandvi to sate cravings even when his lovely local Gujarati Rasoi cafe is closed, I say hooray – and bring on the besan! In the manner of a rather lovely lunchbreak, ‘Devnaa’s India’ opens with chutney and closes with chai. In between, there are chapters devoted to the snacky farsaan at which Gujaratis are so great; to street food, including chaat guaranteed to get conversation flowing; then to mains and a basket-full of breads. Don’t skip a single page. And do not dare skip dessert. 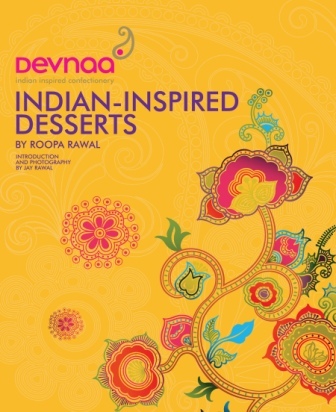 Roopa is renowned for her sweet way with mithai – indeed, those trademark awesome Anglo-Indian sweetmeats are the very reason Devnaa first came to fame. Here, Roopa’s restricted herself to a handful of recipes. You, however, will exercise no such restraint when it comes to tucking into chocolate shrikhand, saffron semi-freddo or the creative kheer pakora. Yum, yum, and thrice yum. Quite aside from my small hand in its craft, Jay and Roopa might have well crafted ‘Devnaa’s India’ just for me. Yet I detect that its endless appeal won’t stop at my stovetop. If you like Indian, you’ll dig it. If you like veggies, you’ll dig it. Heck, if you like food, you’ll dig it. Ya dig? Cause I most definitely do. Dal makes the world go round. Metaphorically for me, but, for many, a lentil stew in one form or another literally forms the basis of their diet. Eaten day in, day out, usually paired with simple boiled rice or wholesome griddled flatbreads, it’s both a satisfying and highly nourishing way to simply sustain oneself on a shoestring. However humble, it always tastes amazing – whether you use tiny salmon-pink masoor, creamy yellow chana, slippery mung, or a mixture of all those and more besides. ‘Dal’ refers to both the preparation and the split, dried pulse itself – an umbrella term incorporating more incarnations than you can imagine. And preference is largely dictated by upbringing. Across the Indian subcontinent, dal can be variously broth-like, thick, creamy, rich, mealy, smooth, lumpy, gelatinous, spicy, or mellow. It can be little more than a potage of pulses with a little salt and turmeric, or a little more than that –manna fit for the royals if not the gods, enriched with ghee or cream and flavoured with a complex tadka. For something so simple, it sure can provoke heated debate. Dal is so intrinsic a part of Indian identity that encountering an example you find sub-standard can be deeply unsettling if not downright devastating. The topic splits opinion like the halved pulses themselves – only not as neatly. It’s those blurred lines that make the subject of dal so endlessly engaging. True dal detectives can repatriate a recipe with its region taking clues from the pulse used, the flavours added, and the fat used for tempering. Dal can both inflame and calm tempers. It sates the stomach and soothes the spirit. Little wonder that lentils have historically been viewed as a precious commodity the world over, even representing currency in certain cultures. In Italy, consuming them on New Year’s Eve ensures prosperity for the coming year. If that’s the case, eating your way through the 50+ recipes in ‘The Dal Cookbook’ will have you coining it in for a few years to come, without ever duplicating a dish. It’s precisely people’s pickiness with their preparation that affords ‘The Dal Cookbook’ its sheer diversity. These dals have retained every drop of authenticity because, for the most part, cooks stick stubbornly to the type they were taught. No matter how off-piste they might go with reworking other recipes, there’s something sacred about these split-pea stews. This parochial pulse preference means traditions are preserved – but, on the flip side, that there’s been little cross-cultural exchange between cooks of Indian regional cuisine when it comes to dal. Whether you’re in Delhi or Dagenham, one pledges allegiance to one’s own definition of the definitive dal, and preaches its gospel as the only way, the truth and the life. So, for would-be discoverers of dal in all its myriad forms, Krishna Dutta’s book is a lifesaver. ‘The Dal Cookbook’ is a clever compendium of regional recipes, presented under geographical chapter headings – ‘North’, ‘South’ ‘East’ and ‘West’. This allows true puritans to stick to the area they feel most at home, but also enables further exploration. And these recipes are worth extensive exploration. Even self-professed dal afficionados will find something surprising here, from the Assamese elephant apple dal of the East to the Goan prawn and coconut version of the opposite coast. Dutta’s dalliance with dal doesn’t stop with relaying so many styles of the stew-like dish – she also broadens the definition to incorporate items which include pulses in the preparation. But that just makes for all the more to enjoy. Hey, we’re here to split pulses, not hairs. That means you’ll find flatbreads stuffed with dal; kichuri – the original humble version of the kedgeree of the Raj; fermented lentils used in a dip from Tamil Nadu, breakfast bits like steamed idlis and wafer-thin dosa pancakes, and deep-fried vadas; and even sweetmeats like mung dal laddoos. The book includes information on buying, storing and cooking; history, etymology, and a photographic field guide to varieties. There’s a good glossary, and even an extra chapter on accompaniments for those unsure with what to down their dal. In keeping with the theme, many, including from-scratch poppadoms, even use dal as a key ingredient. So there’s a lot to digest. And, whilst we’re on that topic, it’s worth dispelling the myth of digestive difficulties caused by pulses. You might have had a few bad encounters with flageolet-induced flatulence, but diligent dal consumption need not require you put out a pre-emptive ‘danger- high winds’ warning. Over millennia, Indian cooks have managed to minimise methane emissions though judicious use of digestives like ginger, fennel and asafoetida – the so-called ‘fetid’ smelling spice that actually stops you emitting an unpleasant odour later down the line. And the bottom line is, when something tastes this good, a few farts are a small price to pay. If you’re embarrassed, blame it on the dog. Or that colleague who really gets up your nose. Then seek solace in yet another bowl of delicious dal. Dutta has collected and perfected a super, and very superior, selection. Even sticking to the ‘North’ chapter, you can eat an entire spectrum; from indulgent dal makhani – the high-fat dish offered in high-end Indian restaurants across Britain – to the dal bhatti of the nomadic peoples of Rajasthan, and the slightly-sweet Parsi preparation. Geographically speaking, it’s all South from there, although there’s no dip in recipe quality. The hotter climate calls for more fiery food that’s a little lighter – Kerala’s restorative ginger rasam, or the fatless kutu. The diversity in climate and culture in the Western states makes for a real mix – Dutta shares everything from a Marathi sprouted mung dal to a peanut-pimped hearty Gujarati one. Bengalis are so in love with lentils that they form one third of the triumvirate that informs their definitive culinary credo – ‘fish, dal and rice’. The Eastern Indian recipes are eye-openers, pairing pulses with everything from green mangoes to fish head; cauliflower to tiny shrimps. A gooey-textured urid recipe yields a dish which is as comforting to Bengalis as macaroni cheese to Brits. So where to start? Don’t dip a tentative toe – just dive right in and drown yourself in dal. 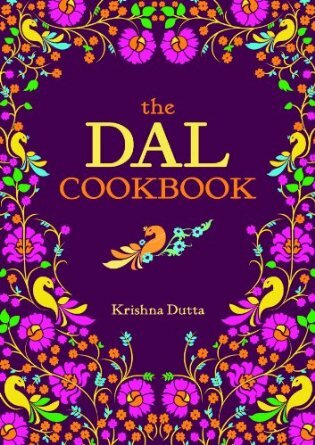 Using cheap, simple ingredients to simply stunning effect, ‘The Dal Cookbook’ is perfect for straightened gourmets undernourished from – and underwhelmed by – dreadful ‘dude food’. Fantastic food that lets you tighten your belt whilst simultaneously loosening it to pig out? That gets my pulse racing. AKA the book I wish I’d penned. And, were I a British-born son of the Subcontinent with a way with a word, a dashing, dandy-ish dress sense, and a slim pencil moustache, I may well have pipped him to the post. But the man in the description got there first – so I drown my sorrows by immersing myself in his edible tales, feasting fervently until I have to lie down with a bellyache. Maybe a cup of long-boiled chai will soothe my greedy gut… but more likely just make it call out for a helping of halwa puri on the side, each scoop of the soft sweet semolina cloaking the tastebuds like a tiny comfort blanket; one of the Rajah’s brilliant bazaar breakfasts. Ivor describes the bizarre and the banal both, always in prose that’s anything but prosaic. There’s magic in this man’s masala. Magic, too, in Ivor’s memories, and in the hands of the male cooks who inspired him – his Dad and a t’riffic trio of Uncles. Each resides within a dedicated chunk of the book, the personal pages littered with the ephemera of life – photos, hand-written notes, menus. Stories, anecdotes and recipes add the meat to those good lookin’ bones, completing the chronicle of each chaps’ cuisine. Ivor entices and tantalises; invites and delights. Some of his tasty, tongue twisting tales are delivered with that tongue firmly in cheek. Following his instruction to listen closely for the wedding cacophony he insists is present in a bubbling beef bughela rather too closely is a messy mistake to say the least, resulting in a condition the mischievous man might deem ‘curry ear’. 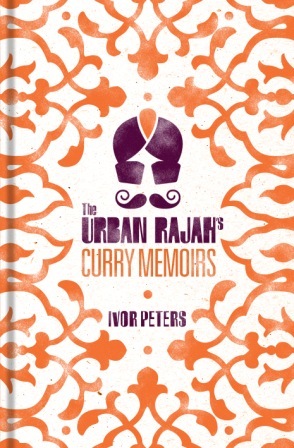 There is curry ‘ere – indeed, even in the book’s title – but the Memoirs go far beyond gravies. It’s Peters’ personal brand of Britishness that enables him to explain esoteric Indian dishes like zarda, Sindhi fish fry and seviyan to a brand new audience, demystifying the diverse. He has a rare talent, opening our eyes to the outlandish, filling us with familiarity for a family we’ve never met. Ivor introduces us, too, to obscure Indian ingredients like karela – the crazy-looking character he colourfully calls ‘punk gourd’, decorated with ‘studs and blunt spikes’. He ushers out your culinary concerns with a jaunty wave, then his hand’s straight into a bowl brimming with churri – chapatti hash – cajoling you to dive in too, to take a leap of faith rather than merely dipping a tentative toe. No recipes for tentative toes – but ladies’ fingers get a look in with Ivor’s dad’s brilliant bhindi bhaji. There’s more outlandish anatomy in paya – a rich Pakistani stew that trots out the old trotters and quickly sends this particular piggy to market, albeit, of course, for sheep’s feet. The livers, hearts, brains and kidneys too, so I can avoid making an awful hash of offal hash ‘kata kut’. Of course your recipe recreations will lack the supreme seasoning that only comes with a slow, lifelong marination in a culinary culture. But Ivor’s memoirs are almost pungent enough to act as a ready-mixed masala, injecting a little of his own edible inheritance to your homemade haleem. The food alone is fine; but digested alongside a tale or two it becomes freakishly fantastic. One chicken dish carries the prefix ‘stolen’, because it’s far too good to be left in the kitchen unattended. Similarly, I reckon I might have to watch out if I leave the Urban Rajah’s covetable tome lying around, lest Ivor’s ‘Curry Memoirs‘ start leaching their seductive perfume. It’s a waft as inimitable and unmistakable as Chanel No. 5; every bit as stylishly seductive; and far, far tastier. And it smells resolutely, reassuringly of printing ink. You can keep your Kindle – I love the smell of a book in the morning. I also love the jolt of a spiced Mysore coffee; the divine Parsi scrambled eggs known as akuri; and the crisp-spongy bite of a dosa dipped into creamy coconut chutney around about breakfast time – and, given chef Kumar Mahadevan’s South Indian roots, I’d assume he feels the same. Fragrance and flavour are here in spades. In fact, flicking through the beautifully-illustrated pages, I swear I can detect the haunting scent of saffron. 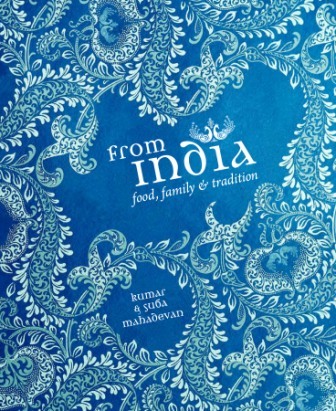 Sheer maya, maybe – but there’s no illusion in the fact ‘From India’ is a collection of thoroughly arresting recipes. And, critically, stories. Personal anecdote, local lore, historic background… each sprinkles its own unique masala over a dish. The more you know the more you taste. The more you taste, the more you perceive. The book has much to offer veggies, with the population of the South following a predominantly vegetarian diet. But for those who are game, you’ll find a whole farmyard gambolling amongst ‘From India’s pages – variously featuring goat, chicken, lamb, beef, venison, duck, veal, quail and pork – the latter notably in the legendary Goa sausage historically informed by- and so similar to – chorizo, thanks to the tiny state’s Portuguese legacy. Curry, curry everywhere, and a vast amount to eat. 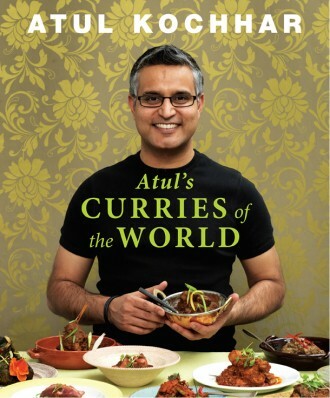 That global march of the saucy, the spicy and the sensational is precisely what Atul found on the world-wide explorations underpinning the recipes in his latest book. The chef’s travels have yielded a fruitful bounty from Birmingham to Burma, placing ‘curry’ firmly in the running for the title of ‘world’s favourite dish’. Although, of course, to deem a singular curry as such would mean pinning down the catch-all term to a definitive definition once and for all. And, as Atul proves even as he uses the word for the title, that simply can’t be done. Instead, the chef prefers to use the descriptor as a handy adjective encompassing soups, stews and even spicy, sauced stir-fries. You could argue the etymology ‘til bellies rumble as loudly as opinions, but what is unarguable is that the loose categorisation has resulted in a right tasty collection numbering some 200 recipes. The book opens with a very necessary, beautifully nerdy and cleverly considered in-depth discourse on the origins of curry – you may devour or dissect; debate or merely digest; but do dive in. Recipe chapters cover both vegetarian dishes and all the meats you could care to mention, each cherry-picking from the world’s premium preparations. Atul is clearly captivated by each and every cuisine he encounters, reflected in often-lengthy introductions that frequently read like odes to the dishes described. Coupled with a good few photos, his enthusiasm is both infectious and irresistible. The chef doesn’t shy away from including recipes that might take a little coercion to try. If anyone can coerce, he’s certainly the man to try; gently persuasive, vividly descriptive, striking the informative tone of a skilled compatriot as opposed to a dictatorial superior. In short, Atul’s the switched-on mate you can rely on to scout out the finest fodder wherever you should land up. And, here, we land up in Laos for the a fruity seafood stew, cruise over to Canada for Mountie chilli, and take a jaunt to the Gulf for a brimming bowl of lamb trotters. The book brims over with recipes, yet Atul is bubbling over with more – opining that he could easily have run into the thousands. As it stands, his ‘capsule edition’ is a nicely esoteric collection, encompassing diverse ingredients and unusual techniques. But these sit cheek by jowl alongside more familiar favourites – beloved British-Indian classics like balti and jalfrezi done very, very well. A diverse, diverting tome that takes you from chicken tikka masala to Tanzanian wilderbeast within its covers; ripe for hours of reading even before you venture anywhere near the kitchen? Now that’s the very definition of ‘novel dining’. One of the most noxious symptoms of the recent boom in street food-vending and supperclubbing is the highly infectious propensity for mercenary trustafarians to coin it in by pedalling the sort of ill-executed, sub-standard generic fodder that would lack heart and soul even if it was offal-based. But, aside from these unsightly, bandwagon-hopping carbuncles, there are a couple of super side-effects stemming from the pop-up epidemic. Such as our collective increased recognition and awareness of the diverse, esoteric culinary specialities of the myriad cultural populations that make Britain so glorious and great. With lower risk involved than opening a permanent eaterie, you’ll find foods at markets and served forth in homes that simply wouldn’t make the menu in most restaurants. Forget attributing dishes to a country or even a county – we now want the full postal address. Which hopefully bodes well for niche cookbook sales. My own interest in ‘The Ultimate Nepalese Cookbook’ sprung from a series of exchanges with Asma Khan, whose Darjeeling Express supperclubs often feature dishes with a Himalayan pedigree. Packed with Oriental nuance and suited to the cold-weather climate, authentic Nepali food is far removed from the blanket ‘Indian’ scran served in restaurants from the high-end to the high street. 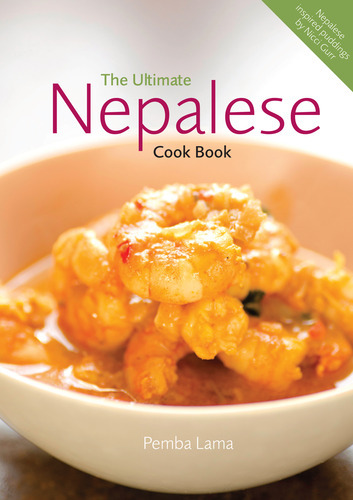 ‘The Ultimate Nepalese Cookbook’ is a collaboration between legendary chef Pemba Lama and editor and enthusiast Annie Watsham – a canny partnership that combines inherent expertise with the learned insights of an outsider. Although the balance is in favour of the recipes, it’s peppered throughout with nuggets of background information. I’d prefer a slightly heavier hand with this seasoning, but for the less ridiculously voracious of appetite for the factoid, it’s pitch-perfect. Nepal boasts a surprisingly diverse cuisine, which is as informed by the dietary constraints of the Buddhist minority in the Hindu state as by the Gurkha fondness for the seafood encountered on coastal expeditions. In this book, Lama shares his proud and unique Gurkha heritage, brought bang up-to date with British chef Nicci Gurr’s recipes for Nepali-inspired desserts. These ‘fusion’ puddings are both eye-opening and, when considered, eminently sensible. Adding salt and tea flavours to the milky sauce on a rasmalai-like pud nods to the trend for salting chocolate and caramel, whilst adding a brand-new dimension to a rather one-note sweet. The haunting tang of black salt in a treacle tart serves perfectly to cut the cloy of the nursery favourite, whilst a cocoa-enriched shell for sweet momos – steamed dumplings – houses creamy rice pudding, combining two favourite Nepalese dishes to render something entirely new. To underpin that ‘something new’, there must also be ‘something old’; found in traditional recipes for Sherpa curry, ‘Ahmila Peero’ chicken and Gurkha cod. You’ll find ‘something borrowed’ in satay, chow mein and stir-fries – only the ‘something blue’ required to complete the proverb remains elusive. Chinese-style recipes display why Indo-Chinese restaurants are so popular with Indians in the UK, the two cuisines harmonising and paying each other the ultimate compliment. My own ultimate compliments must be extended to Lama, Watsham and Gurr, who’ve done a stellar job in filling a very vacant niche in a market over-saturated with generic, banal cookbooks with this enlightening, accessible little Nepalese number. It’s not aiming to set the world alight – rather, it ignites a slow-burning fondness for this esoteric, undercelebrated cuisine, sharing a collection of dishes whose recipes will really put fire in your belly. We’ve all had our full of Mullerlights by now, and cold-snap chomping means we’re far more rotund than ripped. Add to that the ever-encroaching terror of having to pull something sweetly spectacular out of the bag for one’s intended Valentine, and Devnaa’s decidedly different dessert book is a sound preposition. Brother and sister Jay and Roopa Rawal are the sweet genii behind the bijou confectionary company, out to disprove the notion of Indian mithai as the exclusive preserve of those with an entire mouthful of sweet teeth (or, more likely, no teeth at all). Of course, altruism only goes so far. The culinarily inept may prefer to avoid getting sticky in the kitchen and give ‘Indian Inspired Desserts’ as a V-day gift instead. See it as an investment in a future where main meals are mere precursors to barfi and balushahi. Or even forsaken entirely, just to make more room for rich carrot halva. Devnaa has taken the unique approach of fusing the flavours and textures found in traditional Indian sweets with the sort of jewel-like chocolates you’d see in a Belgian boutique, and by ‘eck it works. Yes, a crisp, syrup-soaked batter squiggle might set one’s fillings a-jangle, but temper the intensity with a bitter cocoa hit from a natty dark chocolate dunk and calm is rapidly restored to your jalebi-munching. Apple chutney samosas are simply a tastier take on the puffy turnovers pedalled by Percy Ingle. We Brits are a classically treacle tart-troughing, sticky toffee-scoffing nation anyway, so it seems only right we’d be easily seduced by Roopa’s recollections and recipes for rasmalai, rice pudding, and an Indian-style bread and butter pud fit for kings in more than just its name. There are some wonderfully esoteric traditional and regional specialities here, some of which are broadly elusive outside the subcontinent. Roopa hasn’t shied away from including dishes like mohanthal and seera – the sort of less-glamorous treats eschewed by the gaudy sweet marts. It’s a rare opportunity to try the home-made comforts you’d only be served in an Indian household. She’s also drawn enlightening parallels between sweet traditions in various countries – the use of buffalo milk in India meaning rich Italian dairy recipes like tiramisu adapt perfectly to a bit of spice. It’s precisely the spice that allows Indian sweetmeats to tread a saffron thread-fine line between sublime and sickly. Roopa adds heady, aromatic flavours like cardamom, rose, ginger and chai masala in judicious amounts to ‘Indian-ise’ caramels, cakes and biscuits, then reverses the process for dishes that may prove overwhelming to an unaccustomed Western palate – lightening, toning down and adjusting textures and tastes to yield delicate, balanced results. She likes a fair bit of chocolate, too – and, as most of us know, there’s not much the brown stuff can’t improve. This book could so easily have been filled with the kind of cringe-worthy, excruciating ‘funky fusion’ that alienates absolutely everyone in an attempt to appeal to an all-encompassing audience. But there’s culinary harmony here – the choc-topped gol gappe a case in point. Whatever their heritage or flavour predilection, I reckon pud-lovers will be united in some pretty sweet reverence. In a vastly overcrowded marketplace, Devnaa’s is a refreshingly unique cookbook. ‘Indian Inspired Desserts’ fills a void on your shelves that you probably didn’t even realise existed. Trust me, it does. ‘Why are you doing an impression of Churchill?’ I’m asked by a housemate. No, I’m not puffing on a fat cigar and puttingpeople down in a fabulously cutting manner- he means the nodding dog from the insurance ads. And, actually, he’s not far off the mark. 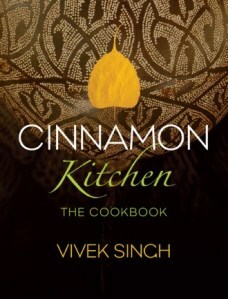 It’s just I’ve got a copy of Vivek Singh’s ‘Cinnamon Kitchen: The Cookbook’ perched on my lap, and every recipe makes so much blimmin’ sense. I’m heading for the osteopath if I stick with the vigorous physical approval, so I switch to a chorus of Northern-style ‘ooooh yes’-es which amuse me and infuriate my accuser. Wind-ups aside, though, the book’s a beaut- a fat tome stuffed with pretty pictures, useful step-by-step technique demonstrations, and the kind of food you’d not just like to eat but actually attempt to cook. Vivek’s not silly. Witty, yes, up for a reet laugh, certainly, but not silly. And nor’sCinnamon Kitchen’s Head Chef Abdul Yaseen- so neither is their food. From day one, Vivek’s been committed to turning out the kind of modern Indian food so many chefs could never quite achieve- blending Western technique and ingredients with Indian technique with style, substance and little time for whimsy. And, in Abdul, he’s found a kindred spirit. Cinnamon Kitchen strikes a balance between the formality of Cinnamon Club and the more trend-led innovation ofCinnamon Soho, and is a rare example of a venue that genuinely offers the best of both worlds. The cookbook brings that triumphant collision straight into your home kitchen, with pretty tasty results. Lara Holmes’ photography helps, but these are the kind of lipsmackers that barely need imagery to inspire greedy lust. From starters through to desserts, taking in mains, grill, snacks and sides en route, ‘Cinnamon Kitchen: The Cookbook’ is a sheer onslaught of culinary excellence- arming you with a bulletproof arsenal to impress anyone with a few tastebuds and a penchant for putting them to good use. Take, for example, the Hyderabadi duck pao with its brioche-like bun; Haddock with a crab and kokum crust; onion seed-strewn Keralan seafood pie; mixed vegetable biryani baked in a pumpkin shell; any of the numerous game recipes like Jungle curry of guinea fowl; an ingenious chaat masala-spiked hummus; or Carrot-ginger halwa tart. See? You’re already feeling greedy. And lustful. The step-by-step pictorial masterclasses littered throughout are handy to have under your apron, too, demystifying techniques such as paratha-coiling and marinating vegetables for the grill. Vivek’s ‘Basics’, meanwhile, mean you can load your cupboards with the artillery of masalas, dressings and condiments that underpin the oft-elusive flavours of well-executed sub-continental delicacies. Vivek reckons the difference between this and his former cookbooks is largely in the amount of washing up you’ll be left with post-cook- leaving ample time for a lengthy and leisurely exploration of the smartly exotic cocktail chapter. Finally disclosing the very recipes which make drinks at Cinnamon Kitchen’s Anise bar such an alluring prospect, it’s a particularly welcome inclusion. But then everything that’s included in ‘Cinnamon Kitchen: The Cookbook’ is particularly welcome. It’s an informative read, but not so prose-heavy that it detracts from the food; attractively presented, but no so that it detracts from the meat on its bones; and aspirational, but not so that it’s offputting. An all-round top book by an all-round top bloke- what a treat. Every so often a book comes along that you wish you’d penned yourself. Not only that, it IS the book you’d have penned yourself. Most of the time it’s authored by someone you have no qualms resenting for their sheer audacity at nicking the concept, but Capital Spice’s creator, Chrissie Walker, is just too damn lovely for me to hold any grudge. Held in high regard amongst London’s foodie Indian elite, Walker has a friendly manner and a pleasing humility. 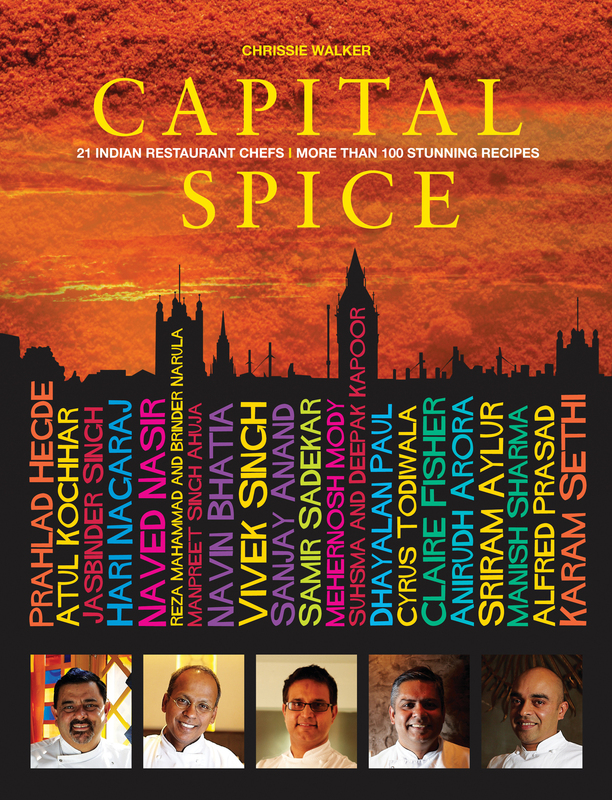 Capital Spice is a labour of love, gathering together 21 of the city’s top Indian chefs and disclosing the recipes that have punters flocking through their doors. For the slightly nerdier reader (i.e. me), the lengthy bios are both welcome and fascinating- who knew, for instance, that Peckham’s Ganpati had Claire Fisher- a Western woman- at the helm? Capital Spice features a good mix of the high end- Cafe Spice Namaste, Cinnamon Club, Tamarind- and the more accessible, everyday joints. It’s a treat to be able to knock up Dishoom’s staple comfort food-supreme, Pau bhaji, or Imli’s snack-y potato cakes, tikki ragda, and handy to be able to roll out the big guns like Zaika’s chicken momoes or Benares’ Kolkata-style lamb rump for Right Posh Dinners at home. The extensive use of game on Indian menus will be a revelation to many- despite the ban on hunting across the subcontinent since partition. Nonetheless, we’re well into the best of the UK season- so recipes such as Star of India’s venison escalopes, Moti Mahal’s partridge pickle, Trisha’s coastal-spiced guinea fowl, Cinnamon Kitchen’s tandoori squab, or even Cafe Spice Namaste’s Ostrich Tikka for the more exotic ranger. Okay, not quite millions. But certainly a more-than-decent selection covering the entire subcontinent- from Ma Goa’s fiery, Portuguese-tinged dishes, to Quilon’s colourful Southern cuisine and the rich Northern opulence of Dockmaster’s House. For me, knowing a bit more about the faces behind the food makes it all the more satisfying- and knowing Capital Spice’s restaurants are right on my doorstep is more satisfying still. Yeah, I’m a smug Londoner- but if I wasn’t, Chrissie’s book would be the perfect introduction to the city’s Indian abundant riches. It’s not easy being an omnivore who revels in the wonderful world of vegetables in all their myriad forms when you’re surrounded by chop-loving compatriots. Alright, I don’t mind the odd Ali Nazik down the Turkish, but a plain hunk of plated protein is monotonous enough to kill my voracious appetite quicker than you can say ‘5-a-day’. Veg, on the other hand, never fail to get the juices going- raw, cooked, pureed or whole… Let me at ‘em. Convincing the crew, however- now that’s a meaty matter. Holy cow, thinketh I, what am I taking on? 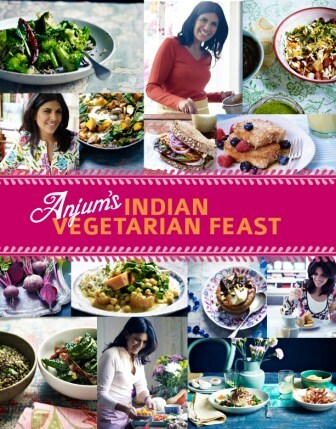 So the arrival of Anjum Anand’s latest, ‘Anjum’s Indian Vegetarian Feast’ is a much-welcome addition to my arsenal in the covert battle to vindicate those ‘vile’ veggies. My strategy is subterfuge- get ’em when they’re least expecting it. And that’s breakfast time, when the weekend fry-up is replaced with a lentil-laden kedgeree and a round of chillas served with coconut chutney. These little pancakes are canny indeed- based on chickpea flour, they’re every bit as proteinous as your average banger and, as is the consensus, far tastier. The signature of an Anjum recipe is her clever combination of familiar and foreign elements, making a hearty nod to tradition whilst acknowledging modern practicalities and newly discovered ingredients- such as the violet syrup in a blackberry compote, or a caper berry chutney to serve with onion bhajis. The cook’s sheer joy in culinary experimentation is evident, and recipe inspiration is frequently credited to skilled acquaintances both in the UK and across India- and her Nepalese Nanny can now also be credited with converting my clan to cabbage and carrots with her momos. ‘Anjum’s Indian Vegetarian Feast’ could well do for Indian food what Yotam Ottolenghi has done for Middle Eastern cuisine, infuriating and engaging Guardian readers in equal measures with his long lists of exotic ingredients. Whilst Anjum undeniably keeps it relatively simple, she’s not averse to introducing us to weird and wonderful vegetables like tindora or karela, or commanding us to purchase unusual proprietary spice blends like chaat masala from local Indian supermarkets. But it’s not an esoteric collection, by any means. Old favourites/nemeses like broccoli, mushrooms and even artichokes are given the spice treatment, all to rather noshable effect. There are even twisted takes on cottage pie and a cobbler that’s anything but ‘a load of old..’ Pick-and-mixing from the various chapters yields a scarily successful meat-free barbecue- Mumbai bhel puri, a tandoori veg feast, mile-high chickpea burgers with purple slaw, Delhi grilled sweetcorn and seed-sprinkled naan. So, after such a wholesome treat- indeed, a wholesome week- a big, bad pud is surely just the thing. As yet, I’ve not even had to use dessert as a bribe, coming home to former guanciale-gnawing gannets merrily engaged in the dainty operation of stuffing okra. But today’s the day for diving into lofty pomegranate soufflés, attacking vast bowls of mango and coconut trifle, and lapping up cardamom kulfi with violet vermicelli. ‘Indian Vegetarian Feast’, indeed. And, despite the initial ambivalence, so say all of us! Having always fancied myself as a classical Kashmiri baker, I’m all overGurpareet Bains‘ recipe for blueberry and fennel flan, from which tradition this recipe originates. Out of the oven comes a rock-cake-like slab of deliciousness. Not sure how historically accurate my endeavour is, but it goes down a treat with the neighbours. And, apparently, has the ability to calm aches and pains. Bonus. That Gurpareet’s an interesting bloke. 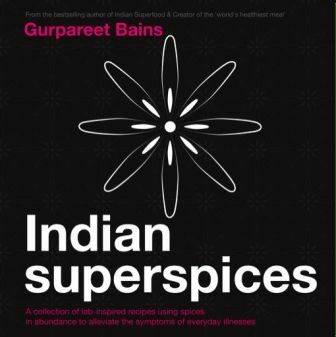 In fusing the science of spices with traditional Ayurvedic principles and damn tasty recipes, he’s managed to pen ‘Indian Superspices’- the hypochondriac gourmet’s bible. Whether you’re stifling sniffles with saag paneer, or battling the hangover from hell with haleem, there’s a delicious decocotion guaranteed to get you back on your feet- or, at the very least, on your bum, scoffing a very nice bowl of food. At first glance, Gurpareet’s measurements seem a little excessive- turmeric by the tablespoon, nigella by the bucketload. Indeed, consuming modest seconds of the lamb masala may well induce psychoactive symptoms, owing to copious use of nutmeg. I’m back in the kitchen, grating away… No unusual psychoactivity, but a pretty decent dinner inducing, as is Gurpareet’s claim, a deep, sweet snooze. Having won 2011’s English Curry Awards’ ‘Chef of the Year’ title, you’d expect Gurpareet to know his way around a recipe- imbuing him with the authority required to have faith when adding goji berries or juniper to a curry. But trust you must- these dishes may be deeply rooted in medical science and Indian lore, but are all underpinned by that most essential factor- taste. Sweetening the pill, indeed. And it’s not just food, either- Gurpareet’s dreamed up beverages to soothe all manner of ills any time of day. Start the morning with a tablespoon of fennel in a pain-reliving tea, perk up your afternoon with cinnamon coffee, and nurse a nightcap of mulled chai-spiced wine with 20 cardamoms. You can even have your cake and eat it too, with a heavily spiced superfruit version. And don’t bother with paltry packs of supermarket spice- you’ll be needing industrial quantities. In case you weren’t already sold on feasting your way around nature’s pharmacy, ‘Indian Superspices’ is littered with quotes from various medical bodies the world over- all pretty solid-sounding stuff. Never mind Heston infiltrating the NHS, Gurpareet should launch a hospital restaurant chain. Slogan? To paraphrase a popular saying- ‘You don’t need to be ill to eat here, but it helps’. Manju’s fifth book comes in a small, neat volume- rather like the author herself. As dependable as expected from such a down-to-earth voice, ‘Classic Indian Recipes‘ is one to keep on the kitchen shelves, it’s enticing photographs destined to be embellished with stains and spatters. The capsule collection of 75 recipes highlights and celebrates regional cuisine- with dishes originating from Maharastra to Madras. The distinctive spice palate of each geographical area makes for a panoply of flavours, textures and heat levels, meaning all-comers will find something to assuage a craving, whether for heat, sweet or sour. 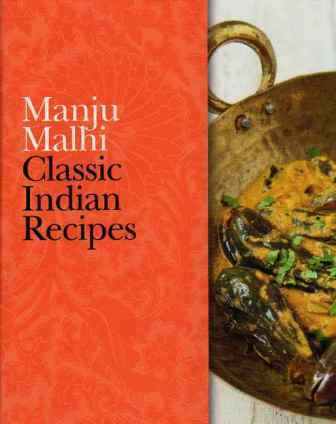 Manju’s prose is informative and concise, acknowledging both native and foreign influence on Indian cuisine. Opening with a brief section on ingredients, techniques and skills provides the amateur enthusiast with enough wherewithall to tackle any of the recipes here- and, indeed, the inspiration to find out more. Use of unorthodox ingredients like Cheddar cheese in the malai murgh tikka kebabs displays the creative innovation commonly employed yet kept somewhat secretive amongst great Indian cooks. The result here is a luxurious meaty mouthful with an elusive creaminess that just won’t quit. Sorry, purists- score one for a cheese-wielding Manju. The choice of dishes is well balanced- dry and wet; rich and fresh- and introductory paragraphs pique the interest, tempting the reader to try a recipe they might otherwise have overlooked. Everyday, homely stews such as Bengali fish curry sit alongside celebratory preparations like Raan- whole roasted leg of lamb, with a few- mutton nihari; semolina-based puja sheera- having particular religious significance. Vegetables go way beyond the ‘curry house sides’; numbering a Moghlai way with paneer; resolutely non-slimy Jaipuri okra; and lip-smacking Keralan aubergines, twangy with tamarind. A penchant for picking is rewarded in the ‘Snacks’ chapter- green bean-stuffed kachoris, the curious Gujerati dhokla- a spiced, savoury cake-, and the glossy chilli paneer Manju likens to barbecued spare ribs, are all unmissable. The dessert chapter ends the book on an appropriately sweet note, a whirlwind of crunchy semolina biscuits, Hyderabadi-style apricot fool and creamy hung yogurt shrikhand. And very, very good barfi. They say the best things come in small packages- an adage the reader would do well to heed when tucking into the diminutive feast that is ‘Classic Indian Recipes‘.